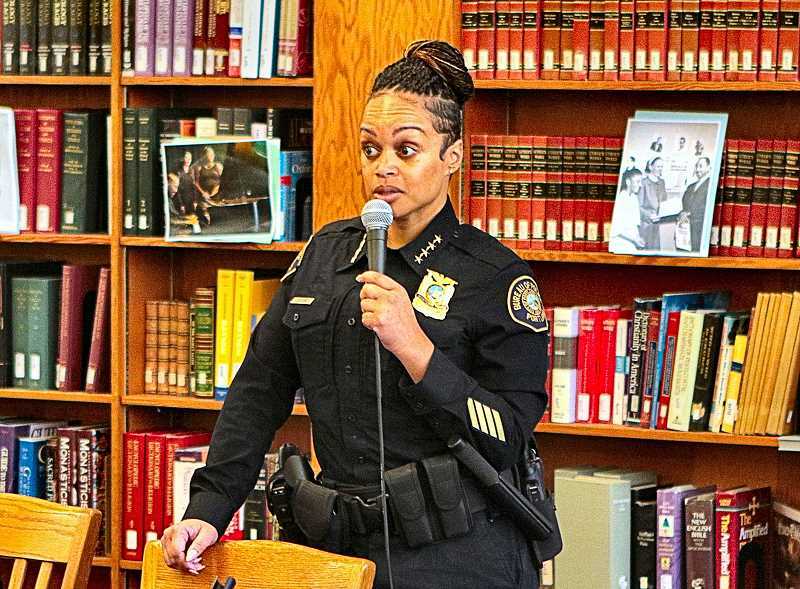 Students at Warner Pacific University (WPU) filled their Otto F. Linn Library on October 15, when Portland Police Bureau Chief Danielle Outlaw came to speak on the topic, "Justice and Policing". "We are so grateful to Chief Outlaw for taking the time to share her vision for policing and justice with us," WPU President Dr. Andrea P. Cook commented before the talk began. "This is a unique opportunity for our students to interact with a civic leader on the forefront of these timely issues in our city." At the presentation, Chief Outlaw explained to THE BEE why she took the time to address the students and answer their questions. "I think it's important for young people, being future leaders, not only to hear from current leaders, but to develop their own leadership style and form what they want to do to move forward. And, this is a good opportunity to connect with the community we serve." Throughout her talk, and into the Q & A session, the Police Chief spoke clearly and candidly – and occasionally expressed herself using quaint, colloquial terms. Outlaw began by observing to the students that she'd just marked her second year in the post on the first of October. "We're working on a Strategic Plan, going through a lengthy analytical process that will give us a five-your roadmap," Outlaw said. "This will tell us not only where we've been, but also where we're going – and importantly: Who, and what resources, we're going to need to do that." Not satisfied to wait for those five years, Outlaw said that because she's one of the first police chiefs recruited from outside the Bureau in decades, she decided to start off getting to know "who's doing it right" under her command – and getting to know, and to build trust, among people in the community. "You can have the strategies of reducing crime, and improving morale, but if you don't have the resources to implement them – the people, time, or money to do it – it's just a strategy that goes up on the shelf," Outlaw commented..
1. Organizational excellence – Looking internally; "training for today" and not past decades, incorporating the right equipment, and making sure the policies reflect the values the Bureau has established. 2. Crime reduction and prevention – "Not just crime reduction, we like to spend the majority of our time on prevention, so the crime isn't even there anymore," Outlaw said. "When we find ourselves being reactive all the time, all we're doing is chasing our tails." 3. Community engagement and inclusion – "You've heard a lot of police chiefs talk about 'community engagement'; but, add 'inclusion' to what we're now doing." "The authority that I get to do my job comes from you, the community; if I'm not seen as legitimate in your eyes (speaking to a student in the front), you might not call the police when you should," Outlaw said. The Chief talked about what she called the "four tenets of procedural justice": Voice, neutrality, respect, and trust. "And this includes the hiring process." In the past, many police officers came from a military background "because police departments are structured paramilitary organizations; but now, we're also looking … to make sure we diversify the Police Bureau. "And I don't mean just your color of skin or gender, we're talking about how you think, and the perspective that you bring. I want diversity in thought as well." About charges of police abusing their authority, for example, Outlaw listed the shooting of unarmed people; people of color being "over policed" in their own communities, such as being "frisked for no reason … we make sure that we do adhere to not only the laws, but also our value systems, based on the principles of constitutional policing and 21st-century policing." Challenges faced by Portland's Police Bureau include burgeoning "houselessness" and larger scale public protests. "There is no cookie-cutter response; problems need to be addressed very deliberately and thoughtfully, case-by-case," Outlaw reflected. The Chief followed the talk with a question and answer session, and received a round of applause at the conclusion.